I am enough intrigued by flag books to have made several of them, but have yet to do the one that interests me the most: where the image coherently stretches from one flag to the next. Maybe that will be my next project, after two or three others I already have in mind. So this is the most recent flag book completed several years ago. It is the fore runner of a series of “Dead Fish” books I will talk about later. 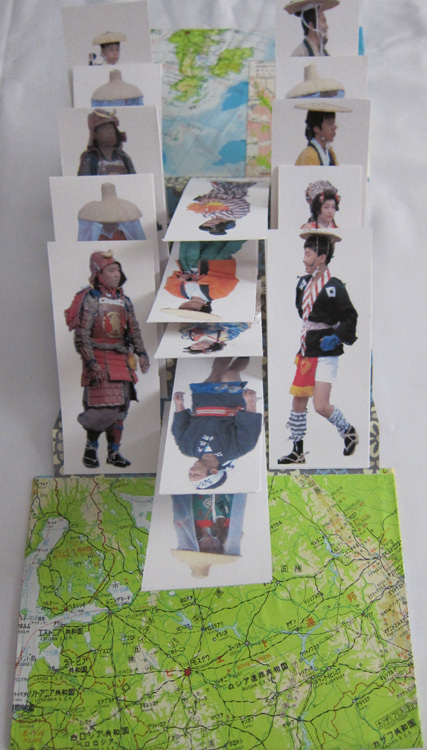 One of the first flag books I made used images from Japan. For the flags, I removed the background from photos I took at a parade in Kyoto, Japan, in 2007. Then I made backs for each image; not great, but passable. They look like paper dolls, or almost like baseball cards. From an atlas printed in Japan that I bought for a dollar I used pages to make the covers. The outside is a light card stock with an embossed metallic finish. Inside endpapers are tie die paper I made in the book workshop. You can see the accordion at the bottom; the fold is only about half an inch. It should have been more like one and a quarter inches. Some of the words I put on the flags don’t show up unless you move them. Below are several of the flag books, and other books made in a workshop. In another workshop I made a flag book using papers and flags previously prepared by the instructor. Subsequently I made a number of flag books I’ll post about later. I think the same workshop also included paste papers. This is a tunnel book using the paste papers. Again, I’ll have more to say about tunnel books. I don’t think I ever made more paste papers. Pam Susan taught a week-long workshop at the Society for Contemporary Crafts. I loved it, was totally wiped out at the end of the week, but very productive. It was all about binding techniques and even included box making. From 2007 to 2014 I created four books about travel in Japan and China. Day to day information appears as it happened earlier in this blog. Here I will discuss the books and how I created them. I collected all of the emails concerning the trips, all of the blog posts and most of my photos. All pages are printed on Epson Matte Presentation paper, which produces vibrant color and excellent definition. All four books use Japanese stab binding or some variant — a mistake. 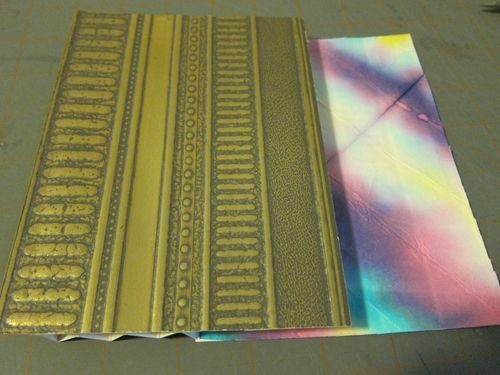 Stab binding is best used on thin books with soft covers. These are an inch or more in thickness and have heavy board covers. I was going for the ‘Japanese’ look and didn’t consider utility. For the first one from Japan in 2007, I brought back a small package of silk scraps that I cut up and machine embroidered on Japanese Washi paper. The glued on bone bead embellishments are from my collection of beads and probably come from India. The second book is from Japan 2008. Using silk from an Obi I first made a photo transfer and then hand embroidered the tree with French knots. I’d like to say ‘never again’ to that, but I’m working on binding a fifth book with the title in French knots. I’ve been working on it, off and on, since 2013. The book block is finished–it may never get bound. I also went to China for a month in 2008 and spent even longer thinking about the binding for this book. I began with a large piece of embroidered red silk. While China clearly has it’s elegant aspects my experience was much more concerned with grit and pollution. Finally I cut up the now dirty, gritty bag I had carried all month, used another photo transfer, a bit of the red silk, hand embroidery–not French knots and embellishments from my collection. The fourth book, from a trip to Japan in 2013, is structurally similar to the other three, but instead of the stab binding I used three brass screw posts, fittingly called Chicago posts. The book is thicker than the others and the posts provide a stronger binding. The paper covering the boards has tiny leaves embedded; the title was printed directly onto the paper. The blue border is book cloth, which covers several mistakes I made during my initial attempt at binding. Finally finished with the hearing book. In addition to binding copies that I gifted to my audiologist and to Tana Kellner from WSW who ran the workshop in Scotland, I bound one copy into this box. While I was working on the book I took a class at CMU Osher called Digital Fabrication. We worked on laser cutting and etching, and 3-D printing. Using a pattern I found here I added the picture of my ear and cut out a box with the picture etched on the cover. Finally finished the box, added the elastic to hold it closed, and adhered a copy of the book inside the box. Many of my books take months or years of gestation before becoming concrete. I’ve been thinking for a long time about this one, which I call “Blast Zone”. Part of the series I have been creating about the climate crisis it deals with oil train explosions and derailments. Since I always try to use my own photos I was stymied. I haven’t had an opportunity to photograph a train derailment for which I am grateful, so I couldn’t figure out what to do. Before I ever went to Scotland the title of the workshop, Mapping our way in these dystopian times, inspired me to think about the train derailments in terms of maps. I collected information about oil train derailments beginning in 2009 and using a website, http://explosive-crude-by-rail.org I created a map for each of the oil train derailments I was able to document. The blast zones show the areas half mile to one mile that are (or would be) evacuated. Unlike most of my books, which are one-of-a-kind, I’m looking for wider distribution of this one. I am working with a friend to call attention to the oil trains that run through Pittsburgh. They go near the Convention Center downtown, the sports stadiums, most of the hospitals, University of Pittsburgh, Carnegie Mellon University, Google offices and the apartment buildings where my friend and I live. I have created a pdf of the book that I gave to the Sierra Club and the Fracktracker Alliance. You can download a copy here. Oil train derailments You might live near one of those blast zones too. The second book inspired by the workshop and nothing to do with Scotland is about my hearing loss. This may also become a best seller (at least 3 copies). All of my hearing aid wearing friends are interested. Tana, the leader of the workshop, has a heavy Slavic accent and speaks in low tones almost without opening her mouth. I had a terrible time hearing and understanding her. She was very good about it and the other participants were helpful so I only missed a few things. Several days into the workshop I was looking for inspiration. Tana suggested I use text in my work. I played with a rubber-stamp alphabet them came up with a small verse and hand-printed it. Altogether not artistic, but somehow satisfying. But words, words are a different thing. Each of the pages are double page spreads and are bound accordion style between simple covers with only the drawing of my ear. My trip to Scotland was rich with ideas and thoughts about making books. I made a quick, first book to bring to my book-making group for our twice yearly book exchange party. This is a simple accordion photo book portraying the wonderful sunsets I found in Scotland. Pages are printed 2-up on 9″x12″ Co Mo Sketch, a soft finish, heavy drawing paper, trimmed to 8×5″, and tabbed together. Finished book is 8.12×5.12″. Most photos were shot as panoramas on my iPhone 6. A second copy is printed on Accent Opaque 100lb. cover, tabbed and bound similarly. Covers are Crescent board covered in Lokta and a simple collage made from previously printed pages. This book taught me some lessons about printing. My first attempt was on a paper called Super Max text. It’s a lovely paper, but it didn’t take the ink very well. I don’t use photo paper, which might give me the best results, but would not be best in a bound book. I tried a second printing on Epson Presentation paper, which also did not please me. Some images printed too harsh and some had strange color, especially the greens. Both the Co Mo Sketch and the Accent Opaque gave me the best results overall. I tried to adjust color management without making much difference. Do pdfs count as books? My father, Morrie and his sister Florence both wrote memoirs about their lives in Austro-Galicia and their early years in Chicago. I digitized both manuscripts, scanned relevant pictures, and created 2 pdfs. Along with my Charnabook, all are available in the menu on the left under Family Stories. I never printed out the two memoirs and created actual books. Although I have a list of 15 possible topics to pursue, with one urgently calling to me, I’ve decided to make those two books first. Should be simple, no? Aside from the novelty structures I enjoy, there are two basic ways to bind a book: folded signatures or single page. The pdfs are single page; after all, they aren’t usually bound. Single page binding, like Japanese stab bindings, can be beautiful but they don’t open flat. I’ve used this binding several times, and I’m never entirely happy. Folded signatures allow for several types of bindings, most of which will open flat. However, they are half a page. The largest signature book I’ve done is 8.5 inches by 7 inches, half of a legal size (8.5″ x 14″) sheet. Until recently that was the largest sheet I could print. I now have a larger printer that takes a 13″ x 19″ sheet. My first task is to decide on my page size, then decide on the binding. The pdfs are 8.5″ x 11″ with several pictures covering an entire page. Half of an 11″ X17″ sheet gives me four 8.5″ x 11″ pages, and all sheets have to be considered as four pages. Morrie’s memoir has 114 pages, Aunt Flo’s has 45 pages. So Morrie’s book would be expanded to 116 or 120 pages; Aunt Flo’s to 48 pages. Some of that is easy; a blank page at the front and back and maybe on the reverse of the title page. Next question is how many pages or sheets in a signature? Placement of the content depends on the number of pages in each signature. For me, keeping the pages straight is the most difficult part of the whole job.